It was a special moment in Eventing history as an ecstatic crowd at the Mitsubishi Motors Badminton Horse Trials (GBR), first leg of the HSBC FEI Classics™, rose to their feet to salute the achievement of Mark Todd (NZL) in winning for the fourth time here since 1980. “Thirty-one years’ experience comes in handy sometimes!” joked the ever-relaxed Todd, whose mount NZB Land Vision had never experienced the rarefied CCI4* atmosphere before. Long acknowledged as the one of the best horsemen the world has ever seen, Todd is also the oldest winner of Badminton (after Andrew Hoy) by an astonishing eight years; he has matched Mark Phillips’ record of four Badminton victories (only Lucinda Green has more, six) and has achieved this major victory after just three years back in the sport after an eight-year “retirement”. The 56 finishers produced 20 Jumping clears between them on Claire Fourgacs’ straightforward track, but it inevitably becomes much harder to achieve as the pressure mounts, and it would be hard to think of a more high-pressure finale than this one, in which the price of a fence covered the top 12 riders. Caroline Powell (NZL), lying 10th after Cross-Country, was first to apply the pressure with a sparkling clear on her 18-year-old Burghley winner Lenamore and this ultimately pulled her up to sixth place. Sweden’s Niklas Lindback, fifth on the much-admired Mister Pooh followed suit, as did Sam Griffiths (AUS) on Happy Times, fourth, and Mary King on Imperial Cavalier (third). Piggy French (GBR) showed the cool head that won her a European silver medal in 2009 and jumped clear on Jakata to score her best four-star result. But they could only watch nervously as the atmosphere reached fever pitch and the stakes rose higher. The next three riders all faulted: Andrew Nicholson (NZL) on Nereo had two down and dropped to 12th below his other ride, 10th placed Avebury; Nicola Wilson (GBR) slipped four places to seventh on Opposition Buzz, and Marina Kohncke (GER) suffered the disappointment of having the final fence down on Calma Schelly, plus two time faults, which relegated her to ninth. Now, Todd is also looking to consolidate his early lead in the HSBC FEI Classics™ and flies to Kentucky tomorrow morning, where he will be riding his world bronze medal ride NZB Grass Valley. King is also aiming to collect more points and is taking two horses, Kings Temptress and Fernhill Urco. Hobby runs a schooling yard in Wiltshire and is a qualified sports injury therapist. Her previous attempt at Badminton, in 2003, on Le Chef, ended when the horse was withdrawn after Cross-Country. Roma ML is a Holsteiner, by Bazar, bred in Germany but bought from Ireland. The pair finished seventh at Blenheim CCI3* last year. Hobby, who is married with two children, is from a Jumping background – her sister, Tina Fletcher, is a member of Britain’s Nations Cup teams - and she was National Junior Champion twice. Mark Todd first came to international prominence at the 1978 World Championships. He then arrived in Britain in 1980 with Southern Comfort, accompanied by Andrew Nicholson as groom, and won Badminton at his first attempt. He won again in 1994 on a chance ride, Horton Point, and in 1996 on Bertie Blunt. He has also won Burghley five times, in 1997 on Wilton Fair, in 1990 on Face the Music, in 1991 on Welton Greylag, in 1997 (taking the Open European title) on Broadcast News and in 1999 on Diamond Hall Red. He won back-to-back Olympic titles in 1984 and 1988 on Charisma and won world team gold and individual silver on Broadcast News in 1998. In 2000, after winning an individual bronze at the Sydney Olympics on Eye Spy, he retired to his native New Zealand to train racehorses. But the lure of Eventing proved too strong and he returned to Britain in 2008 to campaign for the 2008 Olympics, where he finished 18th on Gandalf. He is now based near Newbury, Berkshire, with a string of horses. Land Vision won the Young Horse CIC3* at Blenheim (GBR) and was second at Boekelo CCI3* last year. 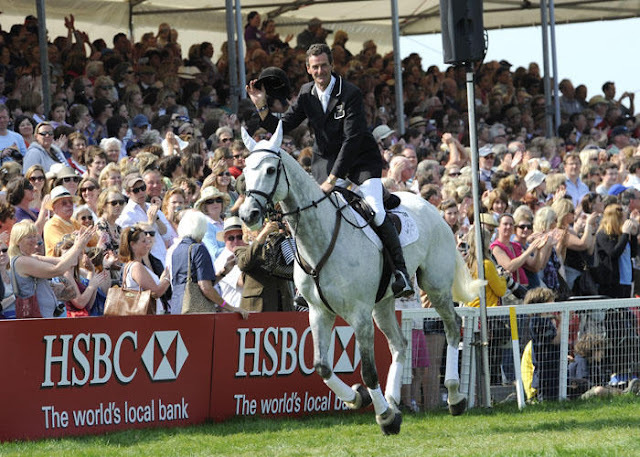 HSBC, the platinum partner of FEI and global sponsor of Eventing, has supported the HSBC FEI Classics™ since 2008 and is the title sponsor. At the centre of this sponsorship is a commitment to the development of the sport of Eventing at every level. HSBC has introduced a Training Bursary, which is a unique award presented to the highest placed rider at each HSBC FEI Classics™ leg who completes a 4* event for the very first time. The winning rider receives a training voucher to the value of $1,000, which is spent on sessions with a trainer of the athletes’ choice approved by the FEI and National Federation. Over the next three years, HSBC will be contributing US$1 million in prize money, which represents the biggest prize fund on offer in Eventing on an annual basis. The HSBC FEI Classics™ 2012 season will begin at Les Etoiles de Pau CCI 4* (FRA) on 12-16 October 2011. This is also the location for the final leg of the 2011 season. Competitors therefore have the unique opportunity to secure points for both the HSBC FEI Classics™ 2011 and 2012 seasons by competing at Les Etoiles de Pau.